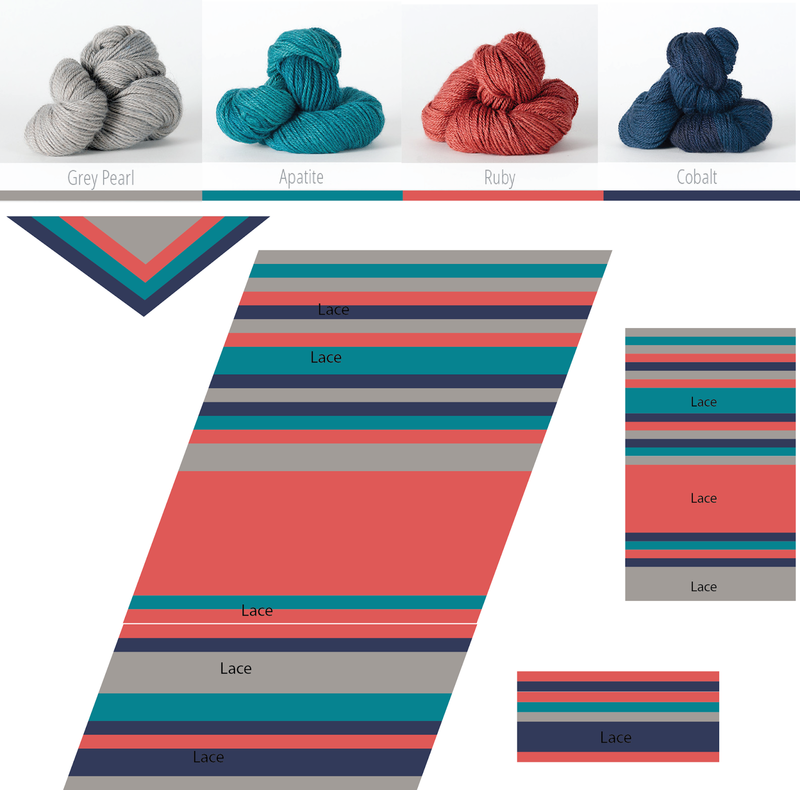 Introducing the 2016 Knit North Yarn Crawl Shawl, Maritana! 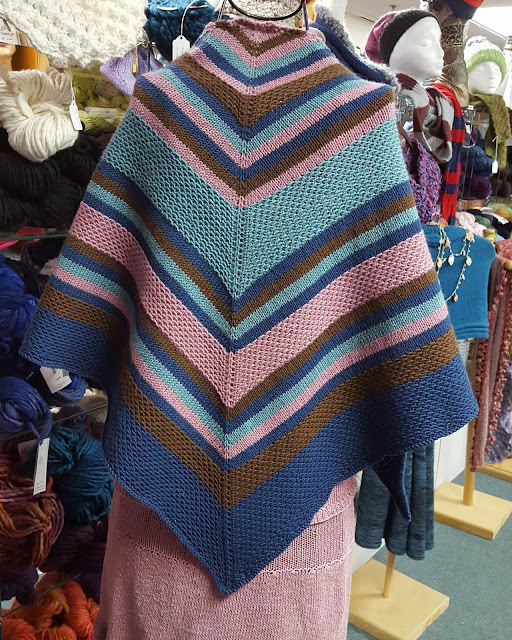 It was back in the fall while I was knitting in the extra comfy chair at Circle of Stitches when the store owner (and friend) Ana Campos asked if I'd be interested in designing the official shawl for the 2016 Knit North Yarn Crawl. I remember it so vividly because I was so excited and honored to be trusted with such a big responsibility! With that, I introduce you to Maritana! While I was eager to jump right in and starting the sample already, I must say that it took me a while to flesh out the exact design of this shawl. The design went through many different iterations of shapes, from an asymmetrical triangle to a biased rectangle, but there were a few details I was steadfast on from the beginning. 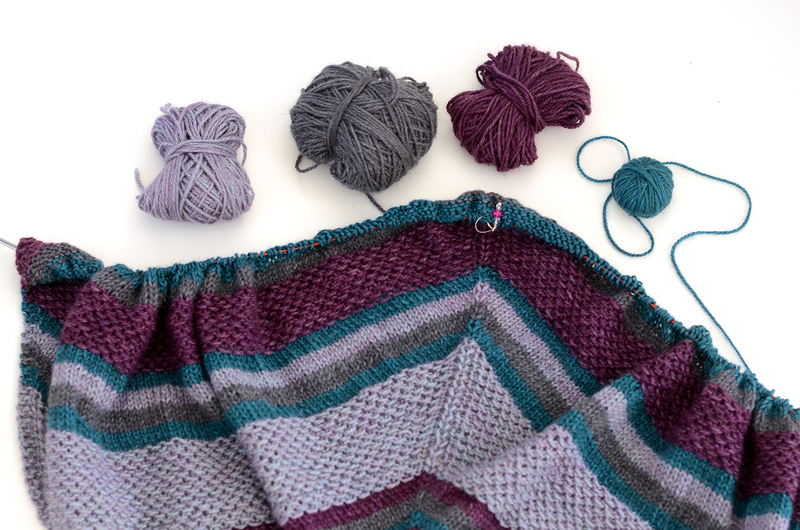 I knew the shawl would be striped, and I knew the yarn colors I would use. Actually, let me back up here. Ana initially suggested to design the shawl in a dk/sport weight yarn, and then she steered me towards The Fibre Co. Road to China Light. Not only was I beguiled its softness, but I was mesmerized with the gorgeous color choices as well. What impressed me most was how well the different colorways go with each other. Even though I knew exactly what four colors I wanted to use for the sample right away, there were so many color combinations I liked just as much. So now we're caught back up to when I had four yarn colors to play with. Like I said before, I also knew I wanted to have a ton of multi-sized stripes. This led to hours of finagling in Illustrator to find the right arrangement and proportions of stripes. Then came deciding on the shape. Ironically I'm not a huge fan of triangular shawls, rather I should say "wasn't". In the past, I found them awkward to wear and hard to keep around my neck/shoulders. My first instinct was to knit a rectangular wrap, but then again I didn't want it to take too long and require too much yarn for the yarn crawlers trying to finish the shawl by the end of March. Then I thought about doing an asymmetrical triangular shawl, but this was right when Melanie Berg's Drachenfels design debuted. Given that almost everyone I know was knitting this shawl (myself included), I figured I'd want to make something different. It was then in talking with one of the employee's at Circle of Stitches, Carolyn, when I decided once and for all to make a symmetrical triangular shawl. It was her advice that "the bigger the shawl, the easier it is to wear" is what sold me on my final decision. And let me say, I'm so happy that I did! This shawl has been my go-to knitwear accessory for the past two months now, because its soooooo comfortable and extremely versatile. I can through it on over a tshirt and jeans while running errands or wear it with a formal outfit at work. However my favorite part about this shawl is just how creative it lets each individual knitter be with their color choices. Check out some of the projects people have already started and even finished already! Carrie McGowan of Oh She Dabbles, is making her shawl out of Anzula Cricket. From now until the end of the crawl (March 20th), the pattern will sold at a discounted price on ravelry. You can also support your LYS by purchasing the pattern in store. You still get the discounted price. I can't wait to see what you all come up with! I know right?! I love the rust so much!